Browsing around my local health food shop the other day, I noticed some new snack bars. I don’t know if they really are new, but I hadn’t seen them before. The box that caught my attention was the Orange Choc Chip variety. None of that fake stuff in these! 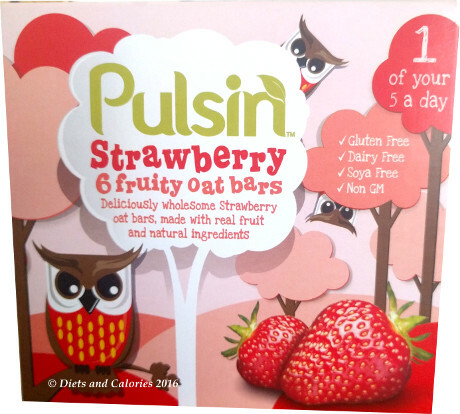 There are 3 varieties of Pulsin Oaty bars and they're all gluten free, dairy free, soya free with non GM ingredients. 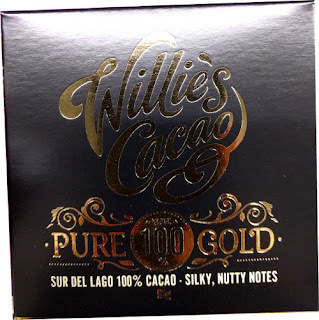 I was nearly put off by the price - £2.99 for a box of bars. However, when I got them home and opened them up, I was pleased to see there are 6 bars inside. I had thought there would be 4 like most of these boxes of snack bars have. 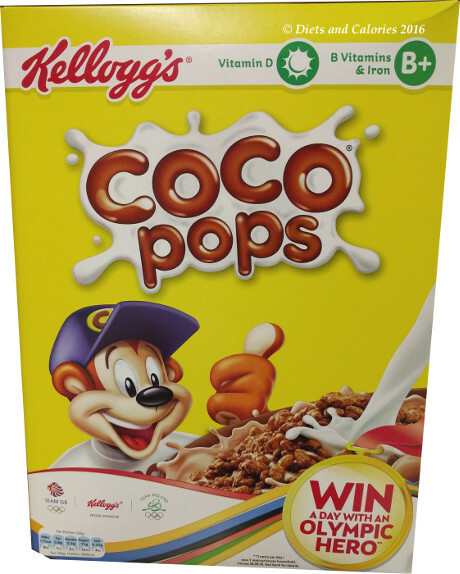 I guess the large ‘6’ on the front of the box didn’t really register. What did register was that each variety has less than 100 calories which is around the number I like to limit my snacks to. 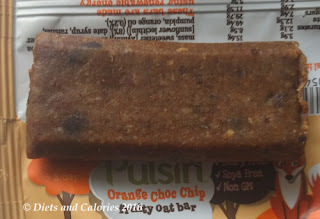 Many health/energy bars are crammed with tons of syrups and nuts so they have loads of calories and the bars themselves are really dense and heavy. This means they’re not great for snacking on unless you’re a really sporty person or someone who hasn’t had time to get lunch. 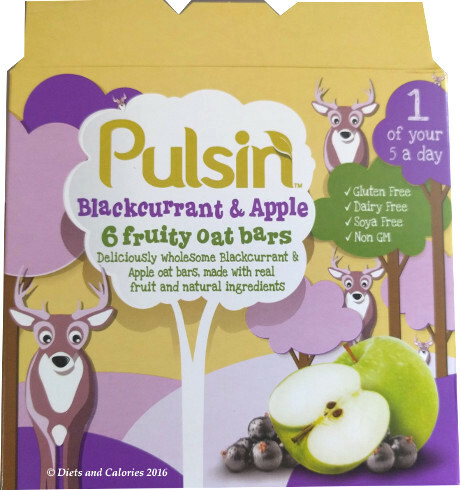 Blackcurrant & Apple – 90 calories each. While Nakd bars have been my favourite so far, I have to say I now prefer these little Pulsin oaty bars. I think maybe it’s because of the oats. 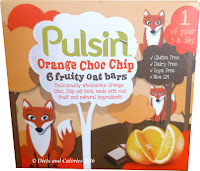 They have a lovely soft chewy texture with all the ingredients blended smoothly together. The Orange by the way, is my favourite flavour. It’s gorgeous, with little chocolate bits that provide a slight crunch then melt into the rest of the bar. They taste just like a chocolate orange. 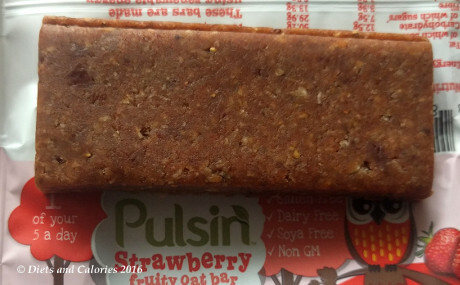 They have a decent amount of fibre in them and each bar counts as one portion of fruit. However, in common with these sweet dried fruit based snacks, they are high in sugar. This comes from the dates, dried fruit, chocolate and added date syrup. So if you’re wanting to get away from sugar, these probably aren’t for you. 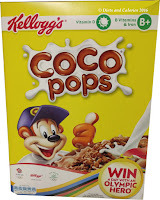 Per bar there is just under 2 teaspoons worth of sugar. Nutrition Information per 25g bar (Orange & Choc Chip): 96 Calories, 3.9g fat, 2.1g saturated fat, 12.3g carbs, 7.4g sugars, 2.9g fibre,1.4g protein, less than 0.1g salt. Ingredients: (Orange & Choc Chip): Gluten free oats (28%), dates, chicory fibre, cocoa butter, chocolate chips (cocoa mass, sweetener Xylitol), cocoa butter, emulsifier (sunflower lecithin) (8%), date syrup, raisins, pumpkin, orange oil (0.2%).